Topics: Medical Dermatology, Cosmetic Dermatology, Education, Forms, and Las Vegas Botox. ns75.worldnic.com, and ns76.worldnic.com are its DNS Nameservers. Ntt America Inc (Colorado, Centennial) is the location of the Microsoft-IIS/7 server. 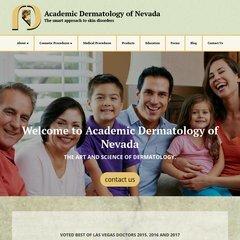 Acadderm.com's server IP number is 209.157.71.190. PING www. (209.157.71.190) 56(84) bytes of data.